Front row from left: Jonathan Fahima, Liraz Rafael, Edith Odor, Judith Lin. Second row: Luis Ortiz, Lama Lhundrup, Nana Bazelam. Third row: Ven. Tamir, Ven. Gendun, Ven. Fedor, Ven. Tenzin Namdrol, Ven. Fran. Have you ever considered following the ancient Buddhist tradition of retreating for the monsoon season to a monastery and spending all those rainy days with studies, meditation, and practice? Maybe there is no rainy season where you live and this idea has never crossed your mind. For a Westerner like myself, who lives in Asia, the monsoon has always caused some headache: how to escape all those hopelessly flooded roads, the sometimes knee-high wading in black, muddy water which carries the filth of a Nepalese street, the impossible traffic, and all the rest that pours down along with the rain. Thus the prospect of getting away from it all and turning those dreaded days into the most worthwhile period of the year has always borne an attraction for me. 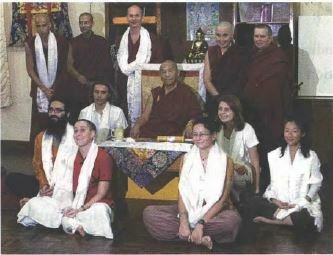 When I met Ani Fran in Kathmandu’s Thamel district in early June and heard of the three-month FPMT Basic Program that was just about to start at Kopan Monastery, I was quickly convinced that instead of trekking in tourist infested Ladakh, Kopan was the place to go until the monsoons ebbed in mid-September.